The military policeman tightly clasps his weapon. His eyes, though wearied by an obvious lack of sleep, dart around intently. Standing guard on the edge of Karachi's Mehran naval base, he and others have been positioned to maintain a firm security cordon. With a mere tilt of his gun, he quickly dissuades anyone tempted to draw nearer to the base. But as even the policeman concedes, this new vigilance has come too late. For the previous 17 hours, the base was besieged by a group of extremist fighters that now turns out to have numbered as few as six; initial reports had put the number of attackers at 15. They slipped into the base undetected, opened fire inside a hangar, damaging two expensive and recently modified aircraft, and killed 10 members of the security forces and wounded 15. Those carrying out the brazen and carefully organized attack seemed prepared to lose their lives. Three of the attackers were killed by the security forces, one blew himself up, and the other two escaped. The horrors of the night before have largely disappeared from view as commandos continue to arrive by bus, their purpose now simply to relieve others on duty. But the scars of the attack will be keenly felt for some time. "I went inside at 4 a.m.," the military policeman says, on condition of anonymity. (He is not authorized to speak to journalists.) "There was total chaos." As beads of sweat trickle down from a beret bearing the navy's insignia and disappear into his neatly trimmed beard, he speaks with admiration of his colleagues' heroism. One name has been constantly mentioned: that of Lieutenant Yasir Abbas, 26, who intercepted the attackers with his rapid-response team on the scene. Before he was killed, the officer managed to stop attackers from causing greater damage, Interior Minister Rehman Malik told reporters. The loss of life could also have been worse. "We made sure that the foreigners who were inside were removed immediately," the military policeman says. The raid had trapped 17 foreign nationals  11 Chinese engineers and six American contractors. They were there to help maintain the fleet of naval aircraft. The military policeman says there was a tense standoff when the security forces arrived in the part of the base where the foreigners were sheltering. "At first, they didn't know if our guys were coming to attack them or rescue them," the policeman explains. 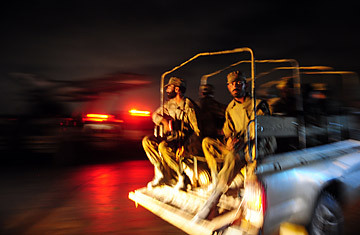 After establishing their bona fides, the security forces moved the expats to a safe compound inside the base, from which they were eventually driven away. "It's good that they were taken in bulletproof cars, because there was shooting," the military policeman says. Once the foreigners were safe, intelligence chiefs in Islamabad sighed with relief: this time there would be no repeat of the headlines about foreigners killed that they saw in 2002, when 11 French engineers were slain in Karachi.